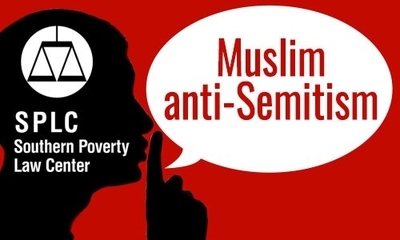 Muslim anti-Semitism receives scant mention from the Southern Poverty Law Center (SPLC), an organization that is supposed to be dedicated to "fighting hate and extremism." Its website has 1,327 articles about non-Muslim anti-Semitic actions, statements or hate crimes. Less than 10 articles out of thousands on its website mention Muslim anti-Semitism. SPLC's credibility has been questioned. It took down its media guide this year after Quilliam Foundation co-founder Maajid Nawaz pointed out that its media guide contained fabrications about him. That guide also attacked IPT Executive Director Steven Emerson. "The SPLC says it fights hate. Yet it criticizes groups that call out Jew-hating Islamists, and ignores groups packed with Jew-hating Islamists," Center for Security Policy (CSP) Executive Vice President Christopher Hull told the Investigative Project on Terrorism (IPT). SPLC accused Fleitz of pushing an "extreme anti-Muslim agenda" for highlighting the penetration of the U.S. government by Islamic extremists. Fleitz says critics are misrepresenting his record: "Please dont [sic] associate me with the above criticism of mosques or the idea that the US should deport Muslims or strip their citizenship," he wrote Saturday. "I do not and have never supported this." SPLC rightly slams Klansmen like David Duke for complaining about a "Zionist occupation of Washington," and other white supremacists for telling the Iranian press that Hollywood is "controlled by Zionists." But SPLC stands silent when CAIR officials spout similar hateful rhetoric. "Do you know how many hundreds of Jewish American kids are recruited to join the Israeli occupation army?" Ayloush said. "No one has ever established a CVE program to see why normal American kids leave their homes to become part of an army committing war crimes... They go to the American Muslim community, although the number of Muslims who join ISIS and Al-Qaeda is ... tiny." 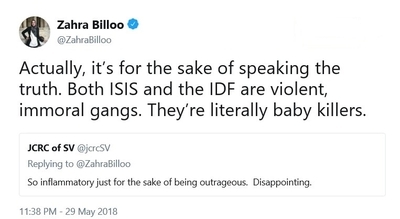 Zahra Billoo, who heads CAIR's San Francisco Bay area chapter, echoed Ayloush's comments about the IDF on Twitter and compared the IDF with ISIS in a May 25 tweet. "Both ISIS and the IDF are violent, immoral gangs. They're literally baby killers," Billoo wrote. She expressed horror last month at "... running into Zionists [sic] war mongers from @AIPAC in the elevators and the anti-civil rights activists from @ADL_National in Congressional offices," during the U.S. Council of Muslim Organizations (USCMO) Capitol Hill lobby days. But Billoo has a long history of promoting Nation of Islam leader Louis Farrakhan, someone the SPLC does identify as an extremist and anti-Semite. She featured a video produced by Farrakhan's group, the Nation of Islam, on her blog in 2010. A year earlier, Billoo tweeted that she listened to Farrakhan while working out at the gym. The SPLC has yet to call out politically prominent Muslims who stand with Farrakhan or who trade in similar rhetoric. For example, the SPLC defended Women's March co-chair Linda Sarsour last year over her use of the word "jihad," describing her as "a loathed figure" among "anti-Muslim groups and individuals." It chose not to address her history of hate speech toward Israel and its supporters. The article even quoted Sarsour's self-hype that she is criticized solely because she is "an effective leader for progress, a Palestinian American and Brooklyn-born Muslim woman." CAIR, meanwhile, has a long history of anti-Semitic speech. Jews control U.S. foreign policy, Executive Director Nihad Awad said in a 1998 interview with The Georgetown Voice. Two years later, he argued that the "ethnic or religious or racial background" of U.S. policymakers explained their then policy toward Iraq. "The Jews [sic] plans [through films they produced in Hollywood] to distort Islam's image ... have succeeded in their plans. This Jewish plan had borne hostility towards Islam and deforming its image," Awad told Lebanon's Al-Lewa'a newspaper in August 2000. Anti-Semitism is a worldview that focuses on "Jews conspiring to harm non-Jews, and that conspiracy explains a lot of what goes wrong with the world," a 2013 SPLC article says, quoting American Jewish Committee expert Ken Stern. That certainly seems to be a problem at CAIR, which the SPLC treats as credible. SPLC quoted Awad on Twitter in April condemning the president's travel ban. But SPLC has been silent since several American imams gave sermons last December calling on Muslims to kill Jews after President Trump recognized Jerusalem as Israel's capital. "Our message to the Palestinian Authority, you have to stop all kinds of peace process, no peace process and negotiation with the occupation in Palestine. Oslo has to be stopped and to be finished. We have to start a new intifada," Qatanani said before leading the crowd in chants of "Intifada! Intifada!" "The Prophet Muhammad gave us the glad tidings that...we will fight those Jews until the rocks and the trees will speak: Oh Muslim, this is a Jew behind me," Imam Abdullah Khadra said in his North Carolina mosque. "The continuation of the well-known Hadith is that the rocks and the trees say: 'Come and kill him.'" Mohamed Elbar, imam of Brooklyn's Islamic Society of Bay Ridge, condemned imams who call for nonviolence against Israel in April. Muslims have the right to use violence against Israel, he said, "so long as the occupier or the aggressor [Israel] possesses more power than you [Palestinians] possess." "[It's amusing that] the SPLC attacks Fleitz for rightly calling out Jew-haters in the Islamic community, yet ignores Islamic groups like CAIR linked to Jew-hating Hamas. Whose side are they on, exactly?" Hull asked. The SPLC classifies any group as a hate group if it "has beliefs or practices that attack or malign an entire class of people, typically for their immutable characteristics," Beirich told Politico last year. By this standard, many Islamist leaders, including CAIR officials, would qualify due to their unabashed anti-Semitism. Failure to include them even when they meet the group's own criteria could suggest that SPLC's bigotry classification system boils down to politics.